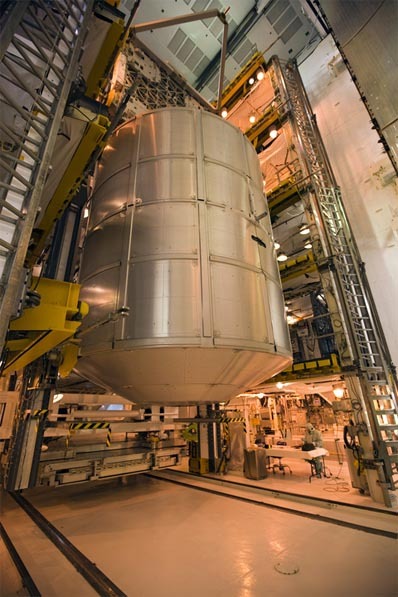 Space shuttle Discovery's cargo bay was filled Monday with the orbiter's final payload complement, a new module and platform that are among the last accouterments for the International Space Station after a decade of construction. 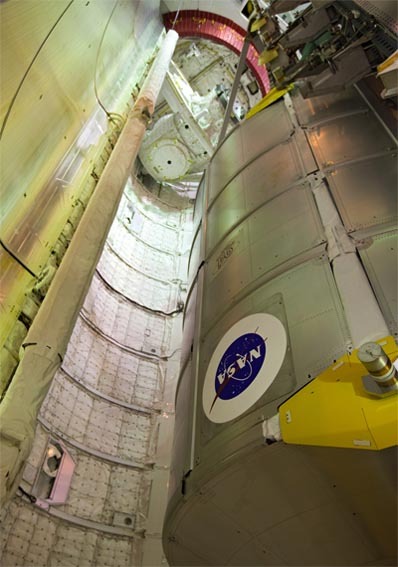 The Permanent Multipurpose Module that will serve as the station's storage closet and the Express Logistics Carrier No. 4 to hold external spare parts will be delivered by Discovery and installed during the November mission. PMM is the retrofitted Leonardo reusable cargo module flown up and down on several previous shuttle flights to the station. 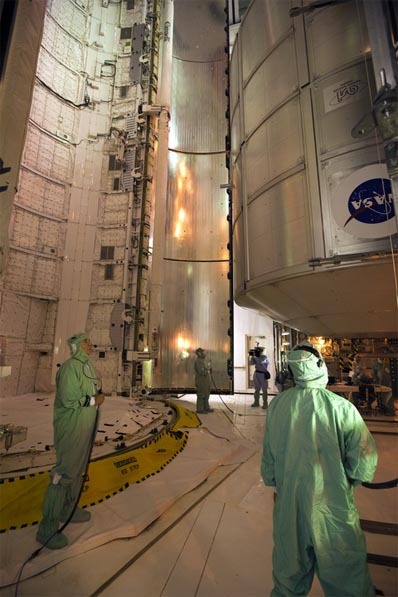 Technicians have armored it with a bullet-proof vest to safely reside in space as a lasting part of the outpost, becoming an extra room to stow hardware and supplies. ELC 4 joins similar deck-like structures attached along the station's truss backbone to store large pieces of equipment outdoors. The platforms have allowed the final shuttle missions to pre-stage hefty replacement parts at the station for future use. PMM will be berthed to the Earth-facing side of the Unity connecting hub and ELC 4 goes onto the underside of the Starboard 3 truss. They take up most of Discovery's cargo bay and their combined weight consume the orbiter's payload-carrying capability. "Our primary objective, the way I describe it for people in a nutshell, is to basically leave space station in the best possible shape for the next era which is the era when we're no longer flying space shuttles," says mission commander Steve Lindsey. "We're delivering logistics and supplies and doing some maintenance and some outfitting to leave it in the best condition we can with what we can carry up." 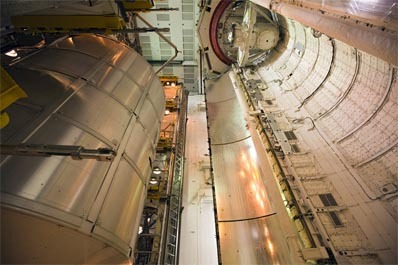 On Saturday, Discovery's 60-foot-long payload bay doors are scheduled to be closed and locked for flight. The launch countdown begins on October 29, leading to the orbiter's final blastoff on November 1 at 4:40 p.m. EDT. 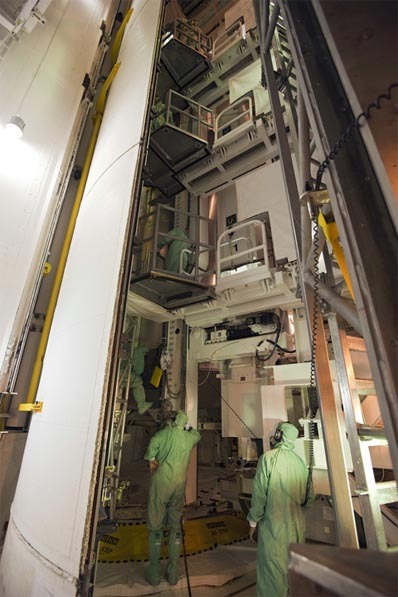 These photos from inside the launch pad 39A cleanroom illustrate the Payload Ground Handling Mechanism maneuvering PMM and ELC into Discovery on Monday.